Now closed: Unfortunately, Sandwich.com is now closed and there aren't any signs of a new location emerging. The best alternative is La Lucha, which is just a few steps away from the old Sandwich.com location on Parque Kennedy. As the name suggests, Sandwich.com sells sandwiches. You’d also be forgiven for thinking that Sandwich.com has some kind of online presence. It doesn’t -- not even a humble webpage. 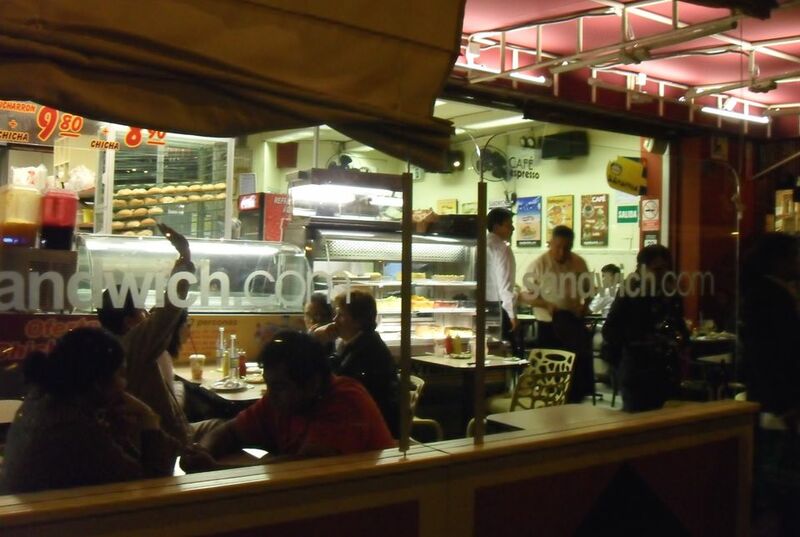 Sandwich.com sits on the Diagonal, the main avenue running along the western side of Parque Kennedy in Miraflores (Av. Diagonal 224, to be exact). Its prime location makes it ideal for people watching, be it early morning businessmen striding to work or late night revelers weaving their way home. If you happen to be one of those late night stragglers, you’ll be pleased to hear that Sandwich.com stays open late: until 1 am every day, with a 3 am finish on Fridays and Saturdays. For soaking up excess alcohol, you can’t go far wrong at Sandwich.com. The sandwiches are the real highlight. The club sandwich is built for two and does its job with aplomb. For something more traditional, tuck in to a butifarra, a classic Peruvian ham and salsa criolla sandwich, or a chicharron sandwich stuffed with fried pork, camote (sweet potato) and red onions. Oh, and don’t forget the fruit juices, all of which are well worth sampling (you’ll often find fruit juice deals during the day). If you’re looking for a more substantial lunch (not that the sandwiches are small), you can order classic Peruvian dishes off the main menu or pick from the daily list of “gourmet combos” and set meals (starting at around S/.17, or US$6.50). In terms of nearby competition, the well-established and ever-popular Sandwich.com is always a strong contender. Sandwichs Miguel sits further down the street, offering a different style of sandwich (super-packed) but without the attentive service. La Lucha (Av. Diagonal 308), a relative newcomer just a few steps away from Sandwich.com, is a worthy alternative if you want to vary your sandwich selection. What Are the Top 20 Things to Do in Lima, Peru?